Of the more than 330,000 U.S. students studying abroad, only 6.1 percent are African American and 10 percent are Latino. 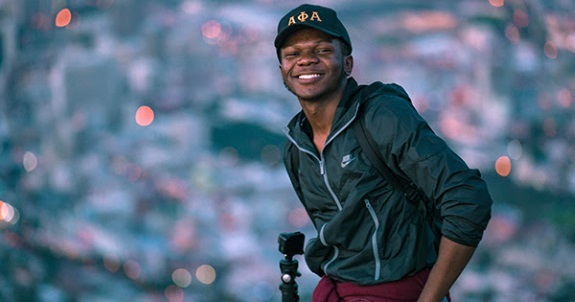 This is one in a series of articles by students of color who are breaking down barriers by studying abroad thanks to the Frederick Douglass Global Fellowship, which awards 10 full scholarships a year to students at Minority Serving Institutions. These students will periodically share their stories, hopefully inspiring others to apply. Nationwide My name is Chiagoziem "Sylvester" Agu. I'm 20, a sophomore of Albany State University, majoring in biology, a member of the Alpha Phi fraternity, with aspirations of pursuing a medical degree in cardiology. A few months ago, I had an extraordinary experience studying abroad in South Africa as a Frederick Douglas Global Fellow. I spent four weeks in Cape Town on a full scholarship, studying political blackness, black consciousness, and the complexities of colored identity. Every day, I was exposed to something different. Although the knowledge I was acquiring was both intimidating and scary, I also found it empowering. This is my story. It was 2001 when my young eyes first glimpsed America. I had flown with my family over 6,000 miles from my birthplace in Nigeria. I attended pre-K in the United States, but after a year, we flew back home. I didn't return to America until 2012 when I arrived in Georgia for high school. Before enrolling in high school, my knowledge of America came from sitcoms and talk shows like Maury and Jerry Springer, which I later learned spread stereotypes and false narratives. In Nigeria, I was on track to graduate high school at 15. When I came to America, I was 14 and technically a high school junior, but I was enrolled as a freshman. I studied hard academically but didn't realize how much I had to learn culturally. It was actually a blessing for me to have the time to assimilate and spend time with American youth in high school. My father, a geography professor and journalist, still lives with three of my six sisters in Nigeria, where it is sometimes hard to express yourself as a journalist. My mother has been unable to work since 2005 when she suffered an aneurysm. She now lives in Texas with one of my sisters, who is a nurse. My study abroad experience was one of the best decisions I have made as a college student. I was one of 10 students from a Minority Serving Institution who received the Frederick Douglass Global Fellowship sponsored by the Council on International Educational Exchange (CIEE) and the Penn Center for Minority Serving Institutions. The 10 of us from all different backgrounds studied for four weeks at CIEE's Global Institute in Cape Town. During that time, I had some of the deepest and most profound conversations and experiences of my life. Learning about South Africa's history and the intricacies of colored identity that pervade the country allowed me to carefully analyze and process how similar South Africa is to the United States. Although the terms that classify different racial subgroups are different and the history of colonization might be different, the struggle remains the same. One day during the program, we went to the beautiful city of Johannesburg. Besides its beauty, we witnessed its unfortunate poverty. Residents wanted us to realize that they do not want money handed to them. They want transferable skills to build infrastructure and the means to create their own wealth, and a better life. I am eager to take all the insight, motivation, and knowledge I found in Cape Town and give it back to my family, friends, and community. My experience in Cape Town as a Frederick Douglas Global Fellow was like getting a new pair of glasses - I felt like I was suddenly able to see more clearly. Studying abroad, every single day, I got a new pair of glasses. Ten college students at one of the more than 600 Minority Serving Institutions across the country will win a prestigious Frederick Douglass Global Fellowship to study in London in the summer of 2019. All qualified applicants win $1500 grants toward studying abroad programs. The Fellowship is jointly sponsored by the Council on International Educational Exchange (CIEE) and the Penn Center for Minority Serving Institutions; applications are due by February 14, 2019, and can be found HERE. The requirements are HERE. CIEE is the oldest and largest nonprofit study abroad and intercultural exchange organization in the U.S.
Their mission is to transform lives and build bridges between people and nations. CIEE programs are at more than 60 international sites, including Berlin, Buenos Aires, Cape Town, Copenhagen, London, Madrid, Paris, Rio de Janeiro, Rome, Santiago, Shanghai and Sydney. Last year alone CIEE provided more than $8 million in scholarships, grants, and financial aid.